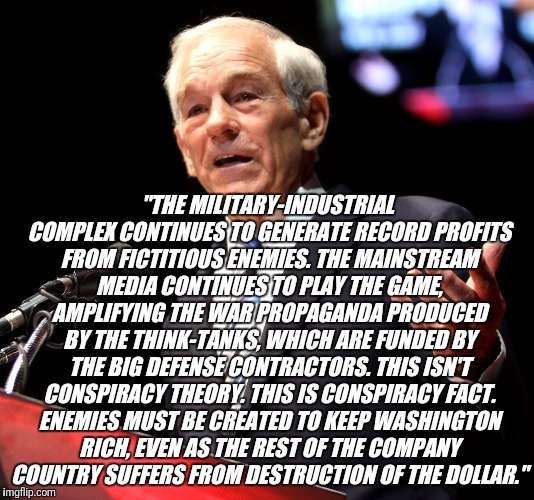 "THE MILITARY-INDUSTRIAL COMPLEX CONTINUES TO GENERATE RECORD PROFITS FROM FICTITIOUS ENEMIES. THE MAINSTREAM MEDIA CONTINUES TO PLAY THE GAME, AMPLIFYING THE WAR PROPAGANDA PRODUCED BY THE THINK-TANKS, WHICH ARE FUNDED BY THE BIG DEFENSE CONTRACTORS. THIS ISN'T CONSPIRACY THEORY. THIS IS CONSPIRACY FACT. ENEMIES MUST BE CREATED TO KEEP WASHINGTON RICH, EVEN AS THE REST OF THE COMPANY COUNTRY SUFFERS FROM DESTRUCTION OF THE DOLLAR."